The National Avian Education Programme was formally launched on June 1, 2017 at the Curator’s House, Botanical Gardens. This Programme is being implemented by the Science Initiative for Environmental Conservation and Education (SCIENCE) and funded by the St. Vincent and the Grenadines Preservation Fund (SVGPF). There were about 50 people present at the launch. It was attended by several conservation partners and invited guests, including teachers, the SVG Coast Guard Commander, representative from Central Water and Sewerage Authority, and Acting Director of National Parks, Rivers and Beaches Authority. Brief remarks were given by Coordinator of the SVGPF – Ms. Louise Mitchell Joseph, Director of Forestry – Mr. Fitzgerald Providence, Senior Fisheries Officer – Mr. Kris Isaacs and the Science Coordinator in the Ministry of Education – Ms. Amaala Muhammad. Ms. Lystra Culzac, Founder and Managing Director of SCIENCE, served as the Master of Cceremonies and also gave remarks during the launch. 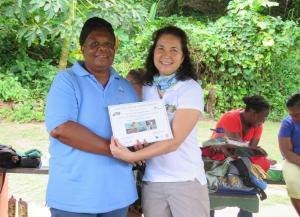 The Featured Speaker for the event was Dr. Lisa Sorenson, Executive Director of BirdsCaribbean. She made presentations on her organisation, the BirdSleuth Training Workshop and introduction to identification of birds. The launch also served as the commencement of a two-day BirdSleuth training workshop. The workshop targeted science teachers from primary and secondary schools throughout St. Vincent and the Grenadines, as well as educators from different national agencies. The BirdSleuth Caribbean curriculum is one of the components of the National Avian Education Programme. The main facilitators of the training-workshop were Dr. Sorenson and Ms. Culzac with assistance from the remainder of the SCIENCE team – Mr. Glenroy Gaymes, Dr. Joanne Justo-Gaymes and Ms. Delrine Gaymes. A total of 22 teachers, two educators from Forestry Department and one tour operator/tour guide participated in the workshop. Activities during the period included creation of bird journals, discussions on the importance of birds in our lives, introduction to binoculars and bird watching, a Migration Obstacle Course, and field trips to the Calliaqua Bay, Diamond Landfill and Blackpoint Recreation Site to observe birds. Teachers were also given assignments where they were expected to demonstrate practical aspects of the BirdSleuth Curriculum to the remainder of the group. The workshop ended with the award of certificates to participants, and brief remarks from Ms. Amaala Muhammad, who made several announcements regarding the upcoming activities of the Ministry of Education, in particular, the upcoming National Science and Technology Fairs. Based on a post-workshop evaluation, participants generally found the workshop informative and relevant to their work. They appreciated the hands-on and practical way that it was delivered, and enjoyed most of all the field trip and bird watching. THOMAS SAUNDERS SECONDARY SCHOOL BIRDSLEUTH PROGRAMME Eight (8) sessions were held with students from this school as part of SCIENCE’s pilot of the BirdSleuth Curriculum. These sessions included classroom presentations, bird species identification and bird watching activities around Kingstown. Some students also attended a field trip to La Soufrière as part of Caribbean Endemic Bird Festival. RADIO TALKS AND PRESENTATIONS Radio talks and presentations were made prior to, during and after the launch and workshop. These included two on the National Broadcasting Corporation and one on Boom FM. SUMMER PROGRAMMES Plans are underway for two summer programmes to be held from 24th July to 4th August; and 7th to 18th August, respectively. The programmes will be held under the theme ‘There is Science in Everything!’, and cater for approximately 30 students each. Registration is currently ongoing. SEABIRD PROGRAMMES FOR FISHERMEN These programmes will be held in August and September, 2017.